Various textures and add-ins make toffee a big candy category. But key to good toffee for me is butter, butter, sugar, sugar, and nuts. In the right ratio, of course. And with a good texture. 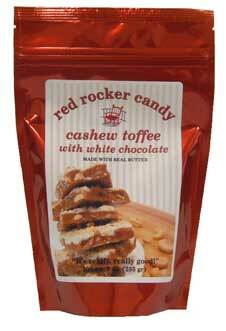 Red Rocker Candyâ€™s Cashew Toffee Candy is outstanding by any toffee measure. Itâ€™s buttery, nicely sweet, and has a perfect texture: solid, but not rock-hard, with great mouth feel. But most importantly, this toffee variety has a delicious white chocolate cashew crumble on top that puts this candy into a very high class of tastiness. Like a true Candy Addict, when I hear the word “Rocky Road” my mind doesn’t jump to ice cream, but instead lands on the candy bar of the same name. 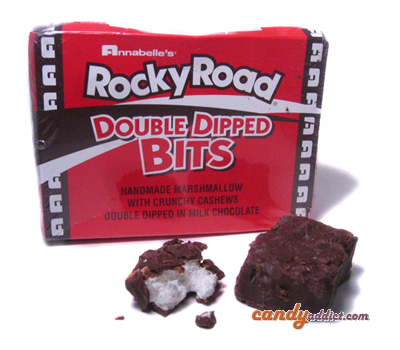 Rocky Road is a classic candy made by Annabelle Candy Company, who are the same makers of my beloved Big Hunk and also Abba Zaba. Rocky Road was Annabelle Candy’s first original candy bar, which debuted around 1950. It’s a big seller in its home state of California, where it remains one of the top 40 best selling candy bars. What makes the Rocky Road so special? Well, it’s a unique combination of flavors to start. Take fresh marshmallow, then layer on some bits of roasted cashews before covering the whole thing in milk chocolate. A classic no matter how you look at it: original, simple and tasty. Over the years Rocky Road has tried on new flavors. Today you can find a Dark Chocolate and Mint variety. This newest version is called “Double Dipped Bits” and they are basically smaller sized Rocky Road bars in movie theater sized boxes. I’ll have to admit, I had never heard of Madelaine Chocolate Novelties, Inc. before they contacted me and offered to send me some samples to review. It turns out they are quite the chocolate powerhouse with currently 449 products online, so you are sure to find something made with chocolate to satisfy your desires. Despite the term “Novelties”, these people are serious about their chocolates. What follows is a rundown and brief review of each item I received for review. How could I resist a candy bar with a wrapper that has a picture of a moose licking its lips? How do you make a Moose Munch Bar? Start with buttery caramel corn. Fold it with smooth chocolate laced with whole almonds, cashews and toffee bits. Drench it in plenty of sweet dark chocolate. Extravagant? You bet. Try some right now! Harry and Davidâ€™s description of their Deluxe Dark Chocolate Moose Munch Bar is accurateâ€”the chocolate was smooth, there was one whole almond, one whole piece of caramel corn, one whole cashew, and lots of toffee. The dark chocolate was sweet but melty and messy. The actual bar rested inside a plastic tray within the wrapper, which nicely protected the candy but also made it appear larger inside the wrapper. I split the 2oz, 290-calorie Moose Munch Bar with a friend, who said â€œthis might be my new favorite candy bar.â€ The Moose Munch isnâ€™t my new favorite, but it was very good. Iâ€™m still stuck on the delicious standard set by the Marich Chocolate Strawberries that I reviewed in May, and even the decadent Moose Munch Bar couldnâ€™t quite make that grade. The Moose Munch Bar also comes in Deluxe Milk Chocolate, although I didnâ€™t see one at Target when I picked up my bar for about a dollar. Before it became a bar, Moose Munch was a mix of nuts, caramel popcorn, and chocolate. Harry and Davidâ€™s regular Moose Munch is available in a multitude of combinations in their gift towers and baskets, or you can buy it in individual packages. After gobbling down the bar, Iâ€™m definitely ready to try some of the regular Moose Munch. I’m still not sure what the snack has to do with a moose, but I like the moose, and I like the candy, and I’m ready for more.